Irving Kirsch's new book The Emperor's new drugs: Exploding the antidepressant myth makes the strongest case yet for antidepressants being merely amplified placebos. Irving does not make reference to a paper by Thomson (1982), which I think was the first to suggest this specific hypothesis. There were also previous references to the importance of the breaking of the blind in clinical trials. 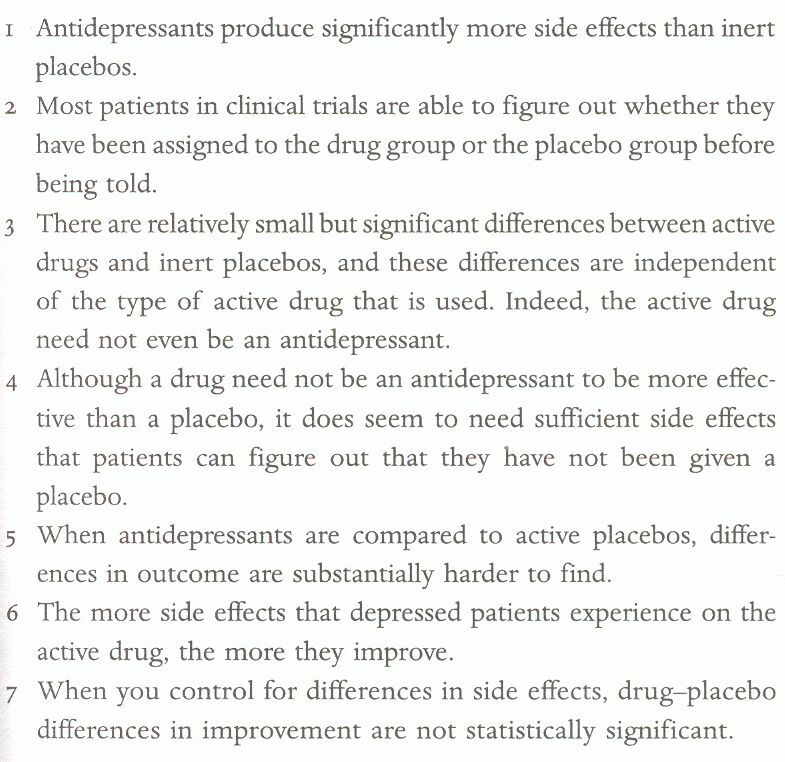 I have always been sceptical about the value of antidepressants and psychotropic medication in general (eg. Limitations of double-blind trials) and share this lack of evidence with patients in my clinical practice. However, I have always felt it has been very difficult to get away from the notion that, however small the difference is between active and placebo groups in clinical trials, there is still a statistically significant difference. If patients have wanted an antidepressant I have felt I have had no choice but to prescribe. Irving is more confident in his presentation of the case than I have been that this statistical difference is an artefact. Perhaps he has been more definitive because he started from a belief in antidepressants, which he no longer has, whereas, having always been sceptical, I have tended to qualify my position eg. Why is the effect size so small?. The final piece of evidence to which he makes reference ie. a paper by Barbui et al is still to appear in print entitled 'Is the paroxetine-placebo efficacy separation mediated by adverse events?' As Irving says, the evidence "may not be conclusive proof, but it is strong". It'll be interesting to see the impact of this more confident case. I've searched and searched for the article mentioned in your last paragraph. Seems like a ghost article, one that is often refered to, but was never actually published. Do you participate in any social sites?